The Sheehan World has a lot to celebrate as summer approaches. In April, Uncle Chuck and Aunt Kate were tickled to meet another great niece, Paige Taylor Cook, the first child of Kendra and Tom Cook of Ferndale, Wash. Paige, aka Smugglet, weighed in at 8 pounds, 4 ounces at St. Joseph's Hospital in Bellingham, WA, and geez, is she cute! Paige has already made friends with the many kitties and other critters that Tom and Kendra feed and care for at their home, and she loves having her picture taken. More photos of Paige are available on Great Uncle Chuck's Web site. There are two other couples -- friends of The Sheehan World -- expecting their first child this spring: Steve and Kara McGowan and Rebecca and John Sheehan. Garrett Charles McGowan, aka "Baby McGoo," was born in April as well. As of this writing (May 28 due date), we are still awaiting the birth of John and Rebecca Sheehan's first child. Bets on when the Sheehan baby will arrive vary from May 4 to June 4. The staff at The Sheehan World left the office shortly after Paige's birth to attend a reunion of current and former journalists from The Atlantic City Press, outside of Atlantic City, N.J. The affair, organized by John Froonjian, brought about 100 people together to reminisce about the good old days and reconnect with former colleagues. 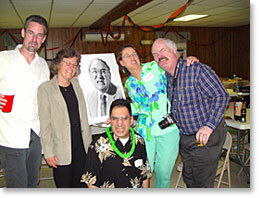 The meanest, filthiest managing editor from the 1970s and 1980s, the late Bob Ebener, was brought to life through a large black and white poster that several current and former staffers grimaced around. Merkoski was so impressed with The Sheehan World and the photos of the reunion that he got Froonjian to send Kathy a beautiful fleece Press jacket. Thank you! 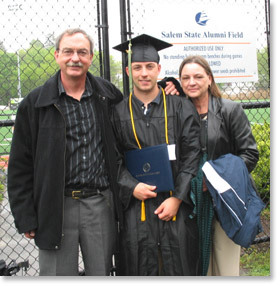 Then there are the 2007 graduates: Paul Mahoney finally got his bachelor's degree from Salem State College in Massachusetts, much to the relief of his parents, Moe and Trisha, of Medford, MA. Paul switched his major several times in about seven years at Salem and finally settled on physical education. He wants to be a coach. Also soon to be graduating from Sehome High School in Bellingham, WA, is cross-country, track, choir and art star Hannah O'Neal. Hannah's track team won the state meet over Memorial Day Weekend. Hannah plans to head off to art school in San Francisco in the fall.